Meet us at the Forensic Technology day on September 25-26, 2018! 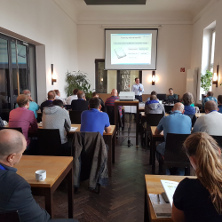 Experts, investigators, companies and government agencies from many countries will meet again in Karlsruhe, Germany to discuss the newest trends, developments and challenges of the IT-forensic industry. It’s the second time ACE Lab has been invited to become a partner of this 2-day closed event. from the field of IT forensics, Big-Data analytics and LEAs. Want to learn more on how to extract digital evidence which seemed to be unrecoverable? So, drop by our booth and explore our solutions to recover intentionally deleted, password-protected, physically or logically damaged digital evidence.